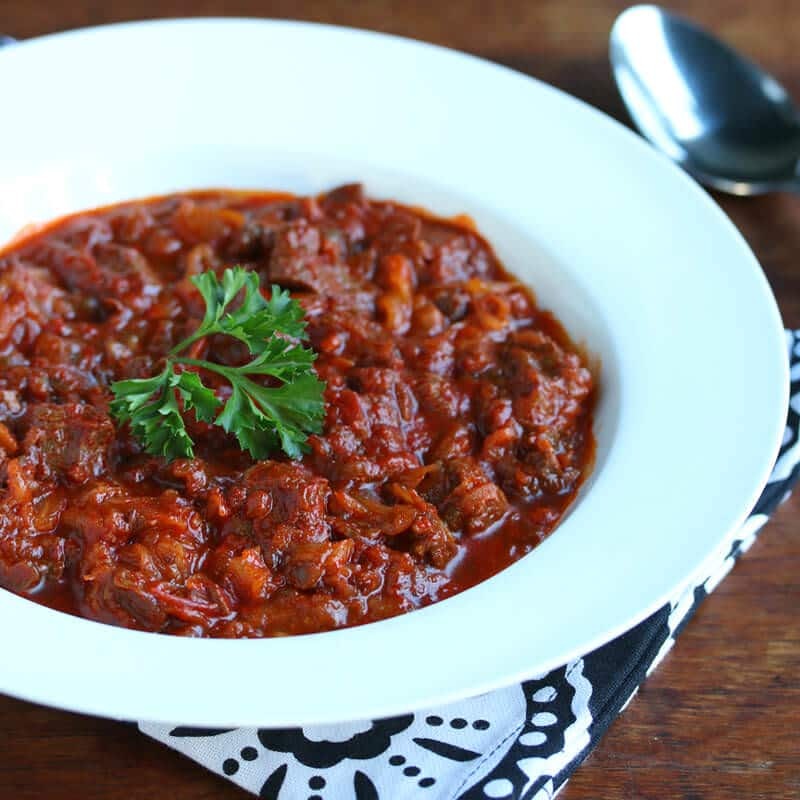 One of Hungary’s most famous dishes, this Szegedin Goulash features slow-simmered, succulent pork, onions and sauerkraut in a wonderfully rich paprika-infused broth. It’s incredibly delicious! The weather is slowly warming but I figure there’s still time to squeeze in one final cool-weather stew. Especially one as good as this. 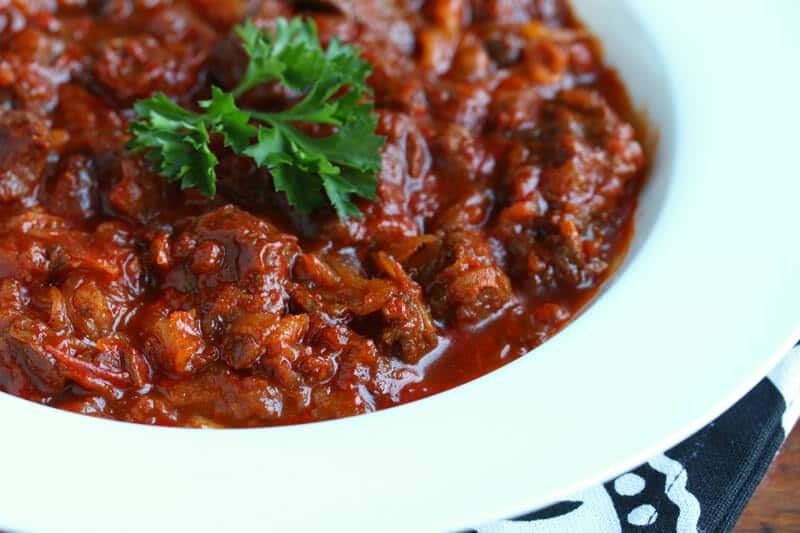 It’s one of my personal favorites: Szegedin Goulash. I can remember the aroma that filled our home every time my mom made this. I’d walk in and immediately recognize the smell. I already knew dinner would be a guaranteed delight! The general consensus is that this dish originated in the Hungarian town of Szeged, famous for its paprika. But there are also those who argue the dish was named after the Hungarian writer, journalist and poet József Székely. The story goes that he showed up at a restaurant just before closing time and was told that all they had left was some goulash and sauerkraut. He told them to just mix it together and since that time people began requesting “Székely’s Gulyás”. Whichever version is accurate, one thing is fact: This goulash is delicious and it’s a very popular dish throughout Hungary, Central Europe and Germany. There are two critical ingredients for getting this goulash right: The right paprika and the right sauerkraut. American sauerkraut won’t do. It doesn’t taste anything like real sauerkraut and is frankly downright awful. Get the real German sauerkraut. Secondly, get quality, real Hungarian paprika. There’s no comparison in flavor. We recommend this genuine Hungarian paprika from the Kalocsa region of Hungary. It has an extraordinarily rich flavor and an exceptionally vibrant red color. Many of our readers have tried it, written back and agree that quality Hungarian-imported paprika makes all the difference. 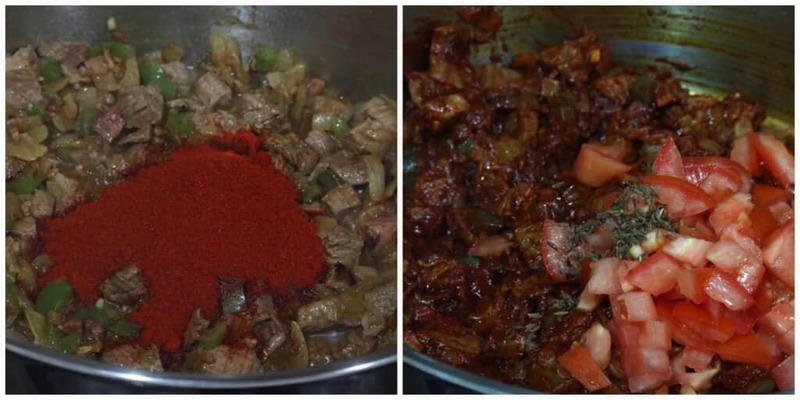 With these two key ingredients, you’re ready to roll and the end result will be a truly amazing Szegedin Goulash that will make your taste buds sing! In a heavy medium stock pot or Dutch oven fry the bacon until done. Add the onions and cook over medium-high heat until golden. Add the bell peppers and garlic and cook for another two minutes. Add the pork and cook for a minute until some, but not all, of the pink is gone. Stir in the paprika and remove from heat. Add the remaining ingredients except for the sauerkraut and sour cream. Add just enough water to barely cover the top of the mixture. Return to heat and bring it to a boil. Cover, reduce the heat to medium-low and simmer for 90 minutes. Stir in the sauerkraut, return to a simmer, cover and simmer for another 20 minutes. Add salt to taste. Serve with a dollop of sour cream and swirl it in the soup before eating. Serve the goulash alone, with some crusty bread, with Homemade Spätzle and/or a leafy green or cucumber salad. 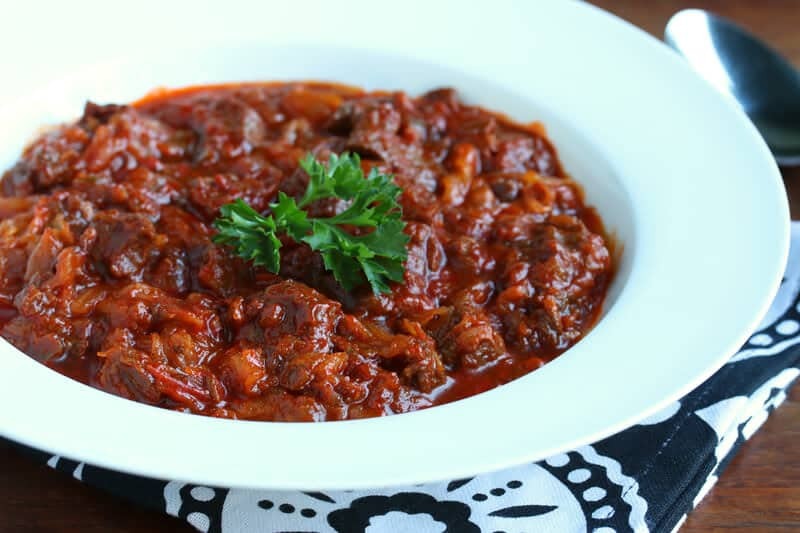 This famous Szegedin Goulash will make your taste buds sing! In a medium stock pot or Dutch oven fry the bacon until done. Add the onions and cook over medium-high heat until golden. Add the bell peppers and garlic and cook for another two minutes. Add the pork and cook for a minute until some, but not all, of the pink is gone. Stir in the paprika and remove from heat. Add the remaining ingredients except for the sauerkraut and sour cream. Add just enough water to barely cover the mixture. Return to heat and bring it to a boil. Cover, reduce the heat to medium-low and simmer for 90 minutes. Stir in the sauerkraut, return to a simmer, cover and simmer another 2 minutes. Add salt to taste. Serve with a dollop of sour cream and swirl it in the soup before eating. Serve with crusty bread, Homemade Spätzle and/or a leafy green or cucumber salad. This goulash is even better the next day. Wow, Kimberly! This really takes me back! My mother used to make this, and I know I haven’t eaten it for probably 50 years. I don’t remember it having bell pepper in the version my mother made. I think this is a memory worth revisiting, so I will be trying this – probably next fall when it cools down again. Thanks for this post. Yes, it’s time to revisit this dish, Susan, it’s been far too long! :) This was always a favorite of mine growing up. I don’t think my mom included bell pepper either. It’s just my personal preference. You know, I think I take for granted that here in western WA we can pretty much eat anything all year round with the exception of two months in the Summer. Down there in the heart of Texas you’re probably already sipping iced lemonade! This looks amazing Kimberly! How did you know it was a chilly day here in Pennsylvania?! I love, love, love this goulash! 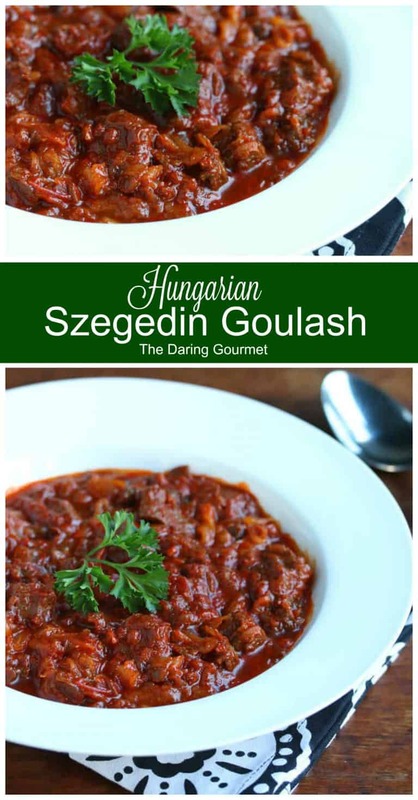 I’ve been searching for a good recipe for Szeged goulash for years and this is it, thank you!!! 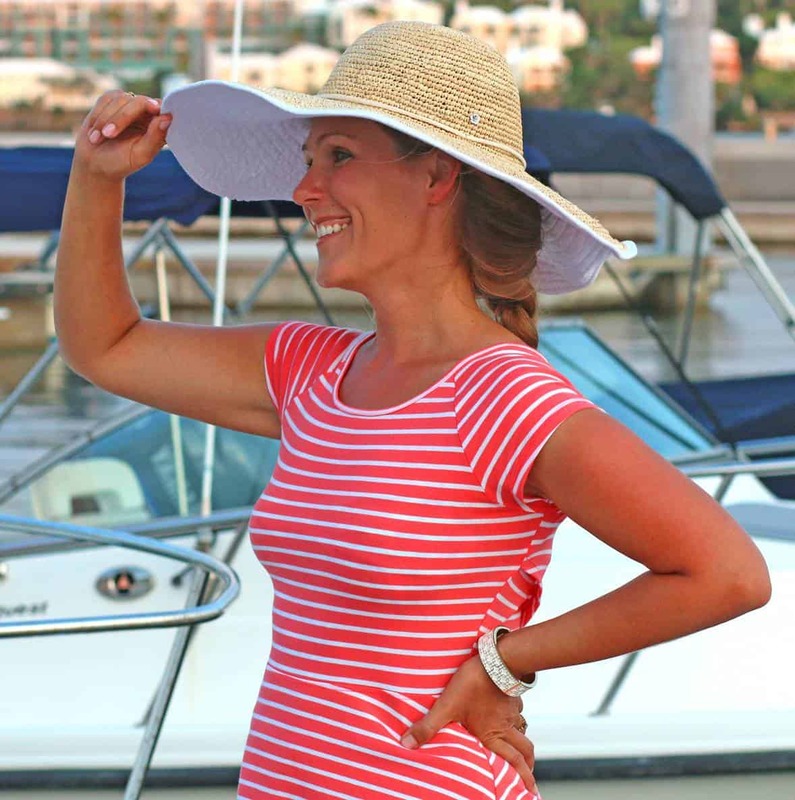 Awesome, I’m so thrilled to hear that, Catherine, and really appreciate the feedback – thank you! I live in Serbia, something like 200 miles from Szeged, and being fanatic follower of Magyar food I tasted many original Magyar recipes of goulash, including the versions in the posh restaurants in Budapest, that the tourist claimed the best. Poor ignorants! Rousevelt Czarda in Szeged is by far No.1 place for anything Magyar and their goulash is similar to yours, every other goulash is rubbish compared to your version given here. So, use this recipe and there is no need to go Hungary any longer! The key ingredients are Hungarian paprika and the bacon, because what you call the bacon in the US has nothing to do with the bacon in Hungary or Serbia or anywhere in the region. Thank you for your vote of confidence, Robert, I appreciate that. I have not been to Rousevelt Czarda but you can trust that the next time I’m in Szeged I will be sure to dine there. Thank you for the recommendation and again for your compliment. Your picture where the tomatoes have been added shows some green colored herb that looks like thyme, yet crushed caraway seed and whole bay leaf are the only non-paprika spices listed. Is thyme in this recipe? Hi John, no, what you’re seeing in that pic are the caraway seeds. I think the lighting is just giving it a slight green tinge. No thyme in this dish. So glad to hear that, Dani, thank you! I agree, the flavor gets even better over time – the leftovers are terrific! Hi Elizabeth, there simply is no substitute for sauerkraut, you’ve got to have it to make this taste the way it’s supposed to. If you can’t find German sauerkraut, which is what I recommend, use the best sauerkraut you can find. 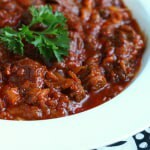 As for specific meat cut, this stew undergoes a long cooking process so it’s ideal for cheaper, tougher cuts of meat. I think there are some pretty good sauerkrauts in North America. Just watch that there is no other ingredient than cabbage and salt. Maybe wine. No vinegar. I make my own, and all I use is cabbage and salt. So good. Hi Suzanna, right, cabbage and salt. I make my own as well. Some brands skip the fermentation process and just pickle it with vinegar – and it’s pretty dreadful. I had some German sauerkraut left, so I thought that Szegedin Goulash might be a good idea. However, this time I wanted the real thing, so I started Googling and found your recipe. Already, had the sauerkraut, bacon, and crushed caraway, but needed good paprika and was lucky enough to find imported Hungarian paprika in the local supermarket – just couldn’t believe my eyes! I finished cooking a little while ago and decided to give it a try (the amount of paprika used made me a bit nervous). It is delicious, the best Szegedin Goulash ever! Thank you for sharing this amazing recipe. Wonderful, I’m so happy to hear that, Michal, thank you! This is one of my most favorite stews and as good as it tastes the first day, it’s even better the second! You are right. I cooked it on Monday, only tasted it briefly. Had it for dinner on Tuesday; finished it on Wednesday, and it was even better! Thanks again for this delicious recipe. Hi Kimberly. I cooked Szekely gulyas two nights ago using your recipe as a guide. There are just two of us, my wife and myself. I left out the tomato, it seemed out of place somehow. We enjoyed the meal then and we have just eaten the leftovers – very tasty. It is midsummer here now and probably not ideal weather for eating goulash but I just had to try it. I will certainly be cooking this dish next winter. Just to clarify, we live in Canberra, Australia. Hi Vincent, greetings to Canberra! I’m so happy to hear that you and your wife enjoyed this dish – thank you very much! I live in Germany and frankly don’t find any great difference between CANNED sauerkraut anywhere. Fresh sauerkraut is, of course, an entirely different matter. I omit the tomato, caraway, and green pepper as I have never had these in Szegedin guylas in Germany or in Hungary. The biggest problem is the meat: American pork has been bred to have less fat and, as a result, has had almost no flavor whatsoever for years (might as well make it with cardboard). I will make this for family in the States next time, if I am able to get down to Mexico to buy the meat. Hi John, the difference in sauerkraut that I’m describing isn’t between brands of German sauerkraut, it’s the difference between German vs. American sauerkraut. And the difference is huge. Tomato, caraway and peppers are very much traditional components of Szegedin goulash. The caraway in particular is one of its distinguishing hallmarks. I couldn’t agree more about American pork, it’s flavorless! Trying this tonight! Looks fantastic. I’m replying almost 2 years too late. But, here goes. What give me the hint that the cookbook you’re referring to isn’t REAL is the use of beef stock. They did not, and in households still do not use stock of any kind. It’s water only. The ingredients with the added water makes its own stock. Garlic stuck on toothpicks? Really? This meal is from the old school, way back when. They didn’t have or use anything fancy. Simple ingredients. I like this recipe. i am Hungarian born and live in Canada. the recipe resembles my grandmother’s. I totally agree about the paprika. in fact I buy ‘Szegedi edes nemes’ paprika in batches and replace it as i use it up…as it loses flavour on standing in the cupboard too long.. I also find that Polish canned sauerkraut is good though i rinse it a few time as it tends to be very sour. I do add a tomato when I have some or leave it out. I also tend to add a bit more sauerkraut as the recipe is quite flexible. Thanks for a great recipe…. yum! Thank you, Val, I appreciate the feedback! I like to make sauerkraut and I’d like to know what the difference is in German Kraut and American Kraut? From what I can find searching for how to make German sauerkraut, its the same way I make it… I know that canned or store bought kraut is no where near as good as homemade but is there a different process for making German Kraut? By the way I love this blog! Thank you for taking the time to put this together! Hi Dustin, I’m referring to the differences in store-bought sauerkraut, not homemade. If you’re making homemade sauerkraut by salting and smashing the shredded cabbage and then letting it ferment in its own juices for several weeks (or longer depending on the temp), then yes, that is the way the Germans make it. And when you compare that to American store-bought sauerkraut it’s very different in flavor. For one, the American stuff isn’t fermented, instead they just add vinegar to it to give it a sour flavor. Here’s a typical ingredients list for American sauerkraut: Cabbage, Water, Distilled Vinegar, Salt, Sodium Benzoate (preservative), Sodium Metabisulfite (preservative), Natural Flavors, Polysorbate 80. Compare that to the typical ingredients in German store-bought sauerkraut: Cabbage, salt. That’s it. So, different ingredients and different method of preparation. Thank you Kimberly! I figured I was making my sauerkraut the right way. Growing up we always made our own sauerkraut and the American store bought is not good! Thank you for clarifying this for me! Us Americans like to ruin a lot of good foods with all the additives. I’ve been researching traditional German foods and found that my mother would make some traditional German dishes but failed at making them. Hahaha. So much has been lost over the generations and I’m loving the true traditional dishes! I hope one day I’ll get to visit Germany and learn more about the culture. My family changed the spelling of our last name to reflect the pronunciation in English. We’ve gone from Vietzke to Featzka, it’s interesting to see there is a town in Germany named Vietzke. You’re welcome, Dustin! Americans aren’t the only ones who abuse additives, but yes, we have some definite changes we need to make in how we approach pre-prepared foods! Yeah, that’s quite the name alteration and unfortunately that sort of thing is far too common – it makes doing family history/genealogy work really challenging. I love that you’ve been delving into that though and food is such a wonderful way to experience and connect with other cultures. I hope you get to visit Germany some day, too! This is most amazingly delicious thing ever. Is it the sauerkraut? The Hungarian paprika? I don’t know what, but it makes your taste buds sing!! It’s everything in combination, Wanda! :) I’m so glad you enjoyed it, thank you!